By "baby," I'm referring to the one that is already here, although technically, the other one got to fly, too. But that means that this was NOT the first flight for the big "baby." Hmmm. Anyway, we had wanted to go on a family trip for a while. For his age (at least compared to me when I was his age), Tuesday has been to many places. 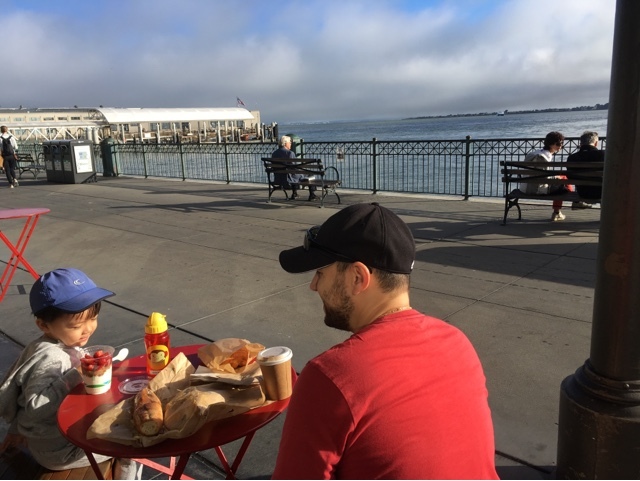 We've done road trips to San Diego several times, once to Solvang, and all the way up to Stanford more than a year ago. I think that last trip was so exhausting that we shied away from trying that again. However, I'm always glad in retrospect to make the effort. Traveling with Tuesday shouldn't be such a big deal. I remember his first trip down to San Diego was when he was five months old, with me still pumping in the back seat while he napped. That trip was easy, but as he got older, he started exhibiting motion sickness. It didn't matter if the ride was 20 minutes or longer, and it happened often, though not every time. This pretty much eliminated all possible forms of in-car entertainment. 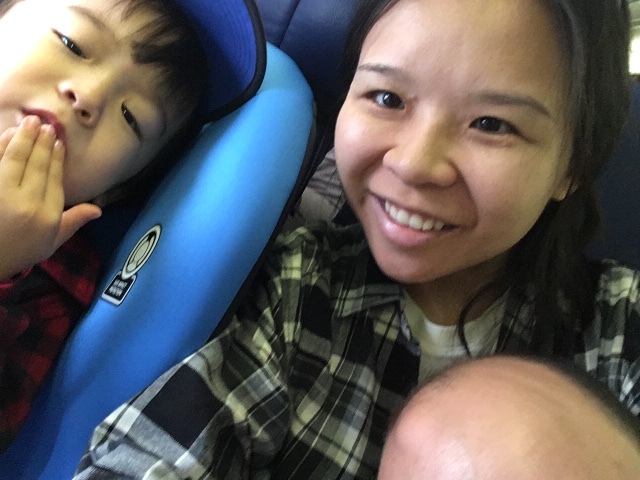 We tried snacks, Sea Bands, timing meals, naps, pacifiers, lollipops, and finally, we decided to flip his car seat forward after he turned two after asking his pediatrician who shrugged and said it might help. Nope. So when we finally decided to try a short flight (~50 min from LA to San Francisco), I knew we were essentially playing with fire, but oh well... easier with one kid than two while we can, right? So we bought a fairly cheap car seat that would fit on a plane (Cosco Scenera for anyone interested) and held our breath. We decided to use a car seat because I'm a paranoid person and also because we had taken an Uber to the airport (which he threw a tantrum on.. sorry, Uber driver). I knew something was amiss when he started to cry mid-flight and wanted to get out of the seat. Unfortunately, they were saying there was turbulence and all had to remain seated. They even stopped drink service. Strangely, I didn't feel anything, and I'm very sensitive to that stuff, so who knows. I pretty much just undid all my precaution and picked him up onto my lap anyway since no attendants would be walking around to tell me otherwise. A while later came my lapful of puke, all over my baby bump and down my pants. A young lady across the way was looking on with disgust, but all we could really do was just swiftly change him with the spare outfit I had in my backpack and then take off my shirt. Luckily, I had been wearing an open flannel that didn't get that dirty, so my wonderful husband held it up as a modesty shield while I quickly changed and then put it back on, buttoned. I would be walking around with half-puke through the train ride and walk to our hotel, which was like two hours later. Fun times. Other than that, we did not have any more incidents like that on the trip. 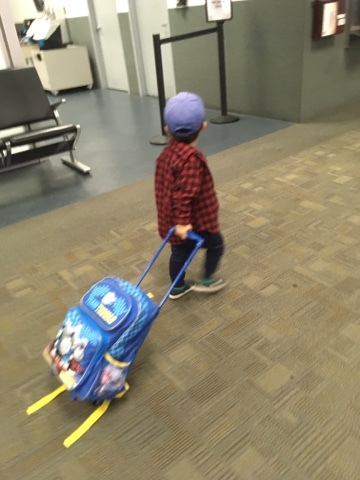 He fell asleep on the plane ride home, which was immensely helpful and made me believe that the extra trouble of bringing a car seat was worth it. 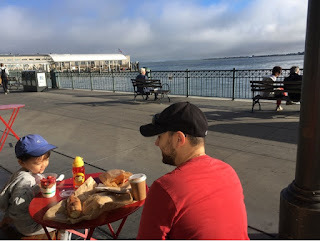 We had a lot of fun taking our time to explore San Francisco like a tourist, since all the times before I had pretty much rushed in and out of there. All the forms of transit were so fun for him, and he did very well with regards to using the bathroom in many random places. 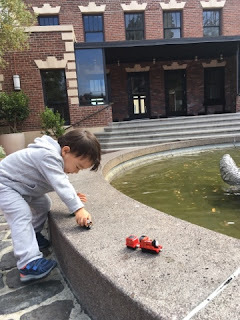 Every place where a train can be played with, it will be played with (Ghirardelli Square). 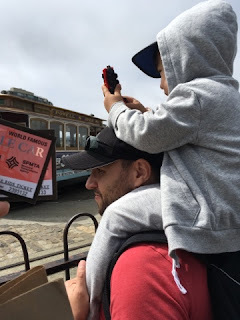 Tourist trap: cable car ride. He loved it, but I did not love the slow wait to get onboard. 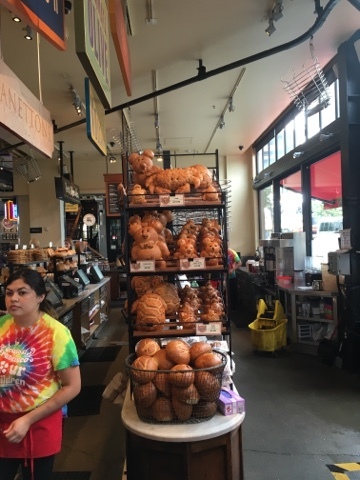 Boudin = bread, bread, and more bread. Poor guy (and you)! Nausea is the most miserable feeling. Maybe he'll grow out of it?